“O my God, Trinity whom I adore, let me entirely forget myself that I may abide in you, still and peaceful as if my soul were already in eternity; let nothing disturb my peace nor separate me from you, O my unchanging God, but that each moment may take me further into the depths of your mystery ! Pacify my soul! Make it your heaven, your beloved home and place of your repose; let me never leave you there alone, but may I be ever attentive, ever alert in my faith, ever adoring and all given up to your creative action. O my beloved Christ, crucified for love, would that I might be for you a spouse of your heart! I would anoint you with glory, I would love you – even unto death! Yet I sense my frailty and ask you to adorn me with yourself; identify my soul with all the movements of your soul, submerge me, overwhelm. me, substitute yourself in me that my life may become but a reflection of your life. Come into me as Adorer, Redeemer and Saviour. 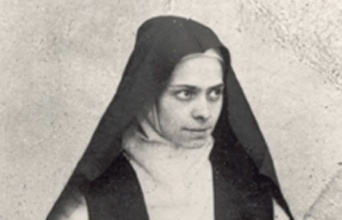 Blessed Elizabeth of the Trinity, (1880 – 1906). This young nun of the Carmelite monastery in Dijon, France. Her life was simple, one of prayer and sacrifice. A quoteation from her sums up her mission. "I think that in Heaven my mission will be to draw souls by helping them to go out of themselves in order to cling to God by a wholly simple and loving movement, and to keep them in this great silence within which will allow God to communicate Himself to them and to transform them into Himself."